affecting its members, even if the current collective bargaining agreement would not allow it to grieve those issues, as in the case of sexual harassment claims. A bargaining unit member may still be able to file a relevant grievance under the Safety Provision found in Article 21D of the collective bargaining agreement, which in pertinent part requires "safe and healthful" working conditions. An employer may still raise defenses to such a request for information. An employer is likely to object on the basis that the request pertains to personal information to which a person is entitled a reasonable expectation of privacy. This is an issue that is in flux at the moment: While the Obama-era NLRB expanded unions' right to information, the new Trump Board may overrule those precedents. But for the present the new rules apply and the employer can be ordered to produce this information in redacted form or subject to other confidentiality protections. The employer could also argue that it has completed its own investigation of the incident, which closes the matter. In Caterpillar Inc. v. NLRB, the Seventh Circuit recently held that a union's interest in protecting the health and safety of employees outweighs an employer's objection to the union conducting its own on-site investigation. In its decision, the Court vindicated the union's right to conduct its own inquiry into a workplace fatality in spite of the company's assertion that it had already conducted an internal investigation. In doing so, the Court upheld the principle that "a union is not required to accept company data as being the last word on a safety issue." These rights must be exercised to have any value. If you believe that an employer is suppressing evidence of sexual harassment, the first step is to go through the Guild to demand that it produce what information and documents it has. 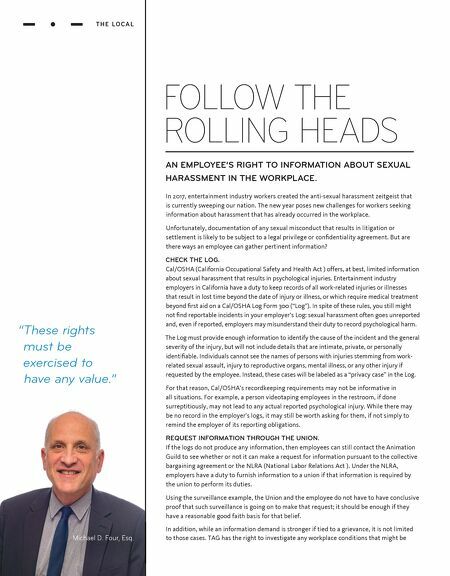 Also, if you have been the victim of a crime, then you may have additional rights to information from your employer under California's privacy or victim's rights laws. – Michael D. Four, Esq. of Schwartz, Steinsapir, Dohrmann & Sommers STAFF SPOTLIGHT DID YOU KNOW Mantta is most likely the first person you talked to when joining the Guild, and she's also the longest-serving staff member (38 years). During that time, she's seen one strike, worked in three buildings and met her husband Mircea Mantta, a Disney TV director, at a Guild Christmas party. WHAT ARE YOUR JOB DUTIES? I handle all of the dues payments, initiation fees. I set up new members. I deal with status slips when employees are hired, when they change classifications, when they get laid off. I always tell members, start here and if we cant help you we can probably get you to the right place. WHAT'S YOUR FAVORITE PART OF THE JOB? Dealing with the members. I love the people. I've watched so many people over the years grow their careers. I also handle the American Animation Institute, and I love when students come here and want to get a job in the industry, and a status slip crosses my desk that they got hired. I announce it to the whole office. WHAT ARE SOME CHALLENGES? The challenges are trying to find enough time to do everything. I'm on the phone quite a bit, the studios send a lot of paperwork and we have a lot more members than we used to. At one point two people did this job and that was back when we had 800 members and now we have over 4,000. HOW DID YOU MANAGE MEMBERS BACK THEN? We didn't have computers. We had this giant board with nametags made for every member. We had them listed by studio and when we got paperwork we would move them from place to place. People used to come in and look at the job board. YOU WERE HERE DURING THE '82 STRIKE? There were reporters all over the building. Everyone would come in and make these gorgeous picket signs because when you're the Animation Guild you can't just carry a sign that says, "On Strike." You've got to have cartoon characters – "Yogi Bear says unfair!" People would drive by the picketers and they wanted to buy the signs because they were so beautiful. 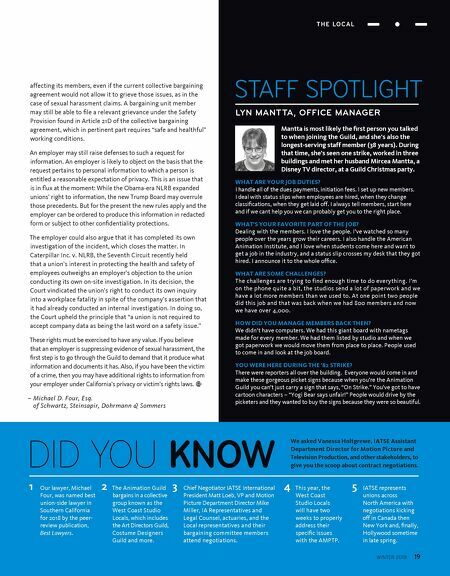 LYN MANTTA, OFFICE MANAGER We asked Vanessa Holtgrewe, IATSE Assistant Department Director for Motion Picture and Television Production, and other stakeholders, to give you the scoop about contract negotiations. T H E L O C A L WINTER 2018 19 1 Our lawyer, Michael Four, was named best union-side lawyer in Southern California for 2018 by the peer- review publication, Best Lawyers. 3 Chief Negotiator IATSE International President Matt Loeb, VP and Motion Picture Department Director Mike Miller, IA Representatives and Legal Counsel, actuaries, and the Local representatives and their bargaining committee members attend negotiations. 4 This year, the West Coast Studio Locals will have two weeks to properly address their specific issues with the AMPTP. 2 The Animation Guild bargains in a collective group known as the West Coast Studio Locals, which includes the Art Directors Guild, Costume Designers Guild and more. 5 IATSE represents unions across North America with negotiations kicking off in Canada then New York and, finally, Hollywood sometime in late spring.